Once it is bubbling, add the plain flour, salt, chilli and bay leaf and cook on medium heat for 2 minutesTake off the heat and gradually stir in the milk. Cook your pasta and combine with the sauce. Slice and fry off your mushrooms. Once they are starting to brown add brussels sprouts and bacon. 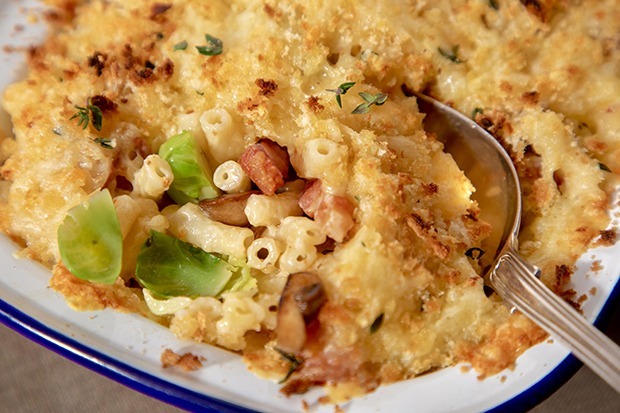 Combine the topping ingredients and sprinkle liberally on top of the mac and cheese and bake for 20-25 minutes until piping hot and golden brown.